Last week Vladimir Putin said it is “quite possible” that Russia will one day join the eurozone thus creating a currency that would replace the US dollar as the global reserve standard. 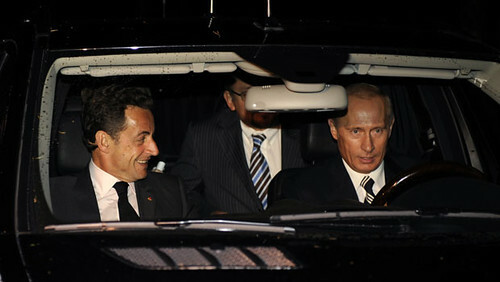 Will the Euro survive long enough to make Putin’s dream of being in the driving seat come true? Speaking at the same event in Germany, Josef Ackermann, CEO of Deutsche Bank, echoed Mr Putin and said he could imagine that happening. This comes as it’s still unclear if the Euro can even survive the current sovereign debt crisis. “The European debt crisis is far from over and will most likely last for years”, according to David Hensley, of JP Morgan in New York. It’s even a question mark if the Europe can handle bailing out Spain, should that become necessary. Vladimir Putin however, is convinced the Euro will not only stabilise but be strengthened. Russia joining the Euro is definitely a possibility in the long term. But by that time maybe the world has already been integrated beyond continents with the world being one “country” with one world currency that could for instance be called World? What is today called countries would be regions of the united world. Mr Putin also stated that for the past decade there has been a reliance on the dollar that needs to be rebalanced for the good of the world economy. Or as he put it: “We should move away from the excessive monopoly of the dollar as the only global reserve currency”. Sounds like we are still in the cold war, doesn’t it? Maybe it’s not a coincidence that Putin’s maternal grandfather was one of Stalin’s chefs? If Stalin was the “Red Tsar” maybe Putin hopes to become the “Euro Tsar”? So is Putin’s dream of joining forces with Europe likely to come true? Presumably with Russia, being by far the largest country, as a driving force? Or is it wishful thinking on Putin’s part? Is he, just like Stalin, making the wrong predictions about world developments? What do you think? Will we see Europe and Russia joining forces or will developments towards a united world happen before that becomes reality? Hi, everybody. One friend of mine has excellent response to the question "When do you marry me?". This response is "On Friday". So generally answering positive he never commits to any date in the future. So merging RUR and EUR together is somehow an idea of announcing something pleasant to audience giving a hope but in the real life it can never happen. The main reason is that in case of joining euro possibility for RU to manage own microeconomics whenever government wants will be reduced dramatically. So my idea is to consider this news as just some pleasant message to Europe supporting the thought of being together against the US. You may very well be right, Artem. Russia, Part 2: The currencies Russia and China really rely on are mined, drilled and manufacturered any way. Putin can make whatever claims he wants about buying into the Euro… See what currencies are most used in his own country on any given day — it's going to have one of the following individuals on it: Grant, Franklin and Queen Elizabeth. Same can be said for China. Will that one day change? Anything's possible. Look what a great job Chavez has done in Venezuala… LOL. But, you need a REAL ECONOMY to play around with currency and neither Russia or China have them. It's the Reese's peanut butter cup principle of economics: you take some chocolate and smash it into peanut butter and call it whatever you want. Dictatorships by definition do not have functioning economic systems, so the Chinese And Russians can define their economy pretty much any way you want. So sure, today the Ruble, tomorrow the Euro. Just make sure that Ivan and Pavel and Natasha are told because Russia today is still not too different from Russia in the 1980's — want to buy something there, pull out some green backs or pounds. My grandfather was speaking of Europe having one currency 20 years ago as well as countries uniting. I do not know much about this issue except what I read and Putin may be testing the waters at this time. It will be interesting to see what he says when Europe and the US start to recover. Putin is against anything the US is for. I think you are right on that the Euro may not last. Asian countries are talking about a joint currency. At this point, people are concerned about the influence of the Chinese and the Yuan. Maybe Putin can make it happen when he becomes President, again. It is scary to me that Russia would consider switching to the Euro. This isn't my field of expertise, by a long shot, but it seems to me that if too many countries adopted the same currency, it wouldn't be a good thing. I don't understand the comment about the dollar having a monopoly. Again this isn't my area, but that hardly seems true. My grandfather was an economist. He worked with two of our presidents and wrote many books on the subject. I wish he were still alive so that I could ask him to write a comment for you! Well Laura the speed with which the world is being integrated and digital in the future there may be just one currency for the whole world. But it will most likely not be one of the ones currently existing. Certainly not the euro. Sweden is seriously considering abolishing cash payments to counteract crime. If in the future the world will do without cash payments I'm sure we will eventually have the same currency unit used in the whole world. This sort of thing has been said forever. It reminds me of the Handmaid's Tale by Margaret Atwood. Great SciFi but poor Americana. Why the Euro? Why not an Asian currency? China's Yuan or a Chinese led Currency? e.g. The Yuasian? Does anyone remember cold war humour?? Why would Motherland want to join in petty, bourgeois, decadent, self-indulgent culture and it's capitalist, imperialist, currency? The Euro will come out of of the doldrums. The Dollar will come out of the doldrums. The world will be fine with or without my input. Slim, what's interesing about this is why Putin made the statement. Russia will obviously not join the EU and hence the euro for a very long time. If ever. Most likely Putin made the statement because he believes joining the EU will be Russia's best bet against a rising China. Russia used to be big brother and Stalin treated Mao & Co. any way he pleased. Now, however, the shoe is on the other foot and it's not to Putin's liking. I can't believe that Russia would adopt the euro. It would make the country too inter-connected and dependent on other sovereign nations and Russia's history is to dominate not collaborate. With much of western Europe's financial woes tied to the euro — countries cannot enact their own financial fixes — the future of the euro is very suspect. The U.K. is pulling out of its recession because it did not adopt the euro and that's beginning to look like a good decision (although criticized at the time). The UK is not exactly pulling out of the recession, and joining or not the Euro certainly didn't put it where it is today, economic mismanagement is responsible for the current situation. Having joined the Euro would have certainly helped the British economy. Many said, and with good reason, that the UK should have joined when the Poud/Euro parity benefited the UK. These days one Euro is about 1.20 Sterling, but a few months ago the euro was worth the same as the pound, with all that that entails to British savings. In my humble opinion, I think it is a question of WHEN, not IF. Tony, the likelyhood of Russia joining the Euro any time soon is out of the question. The EU would not allow them to become a member of the union at the moment. Maybe way into the future. Catarina, some thoughts that occurred while reading your provocative post: First of all, the euro is in dire straits, as you stated, because numerous countries don't appear to be placing much stock in it (i.e., Germany and the UK). Second, Spain, Portugal and Ireland are in such miserable financial condition that while bailouts may seem imminent, the other euro countries appear to be growing suspicious of those weaker nations because if they must be bailed out, the value of the euro will sink even further). If a united Europe was considered to be one nation, it would represent 450 million people, which would make it the world's third largest nation, however, that status would not guarantee its economic clout due to lavish spending on social systems and propping up of inefficient manufacturing networks. Now, about Russia, while it would, as part of the eurozone, represent the largest population base,it now only survives financially due to its huge mineral reserves available to improve its GNP. The country's manufacturing base consistently produces low or unpredictable quality goods not in demand consistently outside its borders. Not exactly a raging success or a new addition that should be embraced by a sinking eurozone. For all of Putin's desire to denigrate the dollar as the international standard for currency, it is only the relative health of the American monetary system as measured by an acceptable ratio of GDP to national debt that allows it to be the gold standard of economic health, unless or until Americans become equally wasteful with regard to social systems and other unprofitable government enterprises as currently occurring in many Eurozone countries. Good comment Kate! What interests me about Putin's statement is why did he make it? There is a reason behind. Maybe he sees Russia's best bet long term to counteract China to join the EU? China used to be little brother that Stalin treated badly. But now the shoe is on the other foot. Wow…big topic. I hope my comments can provide some information as well as my own opinion (somewhat less factual…). The facts quoted are sourced from Wikipedia – I believe they tend to be reasonably accurate. Firstly the USD is, like all currencies, a Fiat currency. That is to say it has no intrinsic value beyond the trust we have in its acceptance by other parties. Any actions that devalue trust in one currency and promote confidence in another could be considered to have a political motive – particularly when they are as speculative as Mr Putins. Contrary to Kate Eaton's comments, the US level of debt is among the heavy hitters of the world, at 94% of GDP now and forecast to be over 100% in 2011. Others are worse but many others are a lot healthier. The USD is rapidly heading towards a date with a very large cliff if the US fiscal and monetary policy don't address their debt levels, and everyone in the FOREX markets knows it. The only reason individual states have not declared bankruptcy is because it is illegal to do so for any US governmental entity. I believe that Putin is currently doing nothing more than playing politics however his words do have some backing in logic. Firstly, the addition of a strong resource base (oil, minerals, food production), in addition to the Russian technology base, would offer some diversity of assets to back the Euro. The addition of the Russian population/market would also strengthen the Euro. Secondly, in spite of comments regarding the nature of governance in Russia, the economy has been rapidly improving on many fronts – not only due to its immense oil wealth. ON a PPP basis it is the 7th largest economy in the world and is rapidly growing after taking a haircut in 2009. Putin and his well trained president know that the American century is at a close. Things are changing – these are historic times. If you watch the currency markets you will know that the USD is being considered less and less as a "risk-off" haven. At the same time the Euro is struggling because of the PIIGS debt issue. The apparent beneficiary is China so how does Putin maintain or improve Russia's position? He can align with Europe to distance it from the US, or align with Brazil, India and China to build an entirely new power bloc. The second option has already been mooted – the concept of creating a BRIC based currency possibly as a reserve currency. However it might take many years to manifest in reality. Another option would be if Putin can further weaken confidence in the USD by bolstering the Euro. This would result in a weakening of the US ability to influence world trade (the last time anyone threatened the USD position Bush went to war with Iraq as Saddam stated that he would sell his oil in Euros not USD – Bush had to stop that) and also injures the reserve strength of China (currently holding 846.7 billion or 20.8% of US debt). Every time the USD devalues relative to the world currency basket the Chinese get hit because they hold so much USD denominated debt. Putin is a WILD card but also a very very smart one. I have no doubt he will do whatever he can to advance Russia's interests particularly where it hurts the US and also positions Russia with advantage for the future. This outburst simply helps drive a wedge into the establishment. Interesting ways of looking at developments, Gavin. Personally I believe that Putin sees joining the EU and hence the euro as Russia's best bet against China. As you point out, America will not be a super power in the long run, but China will become one. Russia used to be China's big brother and Stalin treated the Chinese any way he pleased. Now the shoe is on the other foot and Putin doesn't like it. Wow. I appreciate the new awareness I gained from reading your post. Agree with Paul's comment that Russia needs "more solid footing". Can't imagine this happening yet. Putin is getting ahead of himself and needs to get things in order on his own streets first. Keyuri, there is no way the EU would allow Russia to join at the moment. You only need to read what Wikileaks "revealed", which were no secrets, about the country to understand why. Whenever Russians protest the authorities seem to be in a habit of using, at least, teargas against them. With respect, I'm not sure what gave you the impression Russia is part of the Eurozone? While I agree that we need to have less reliance on a single currency, I think the more likely scenario has to be a weighted basket of currencies. The idea of Russia joining the Eurozone would throw up all sort sof difficulties – not least of which would be NATO. Perhaps Putin is just trying to appear a little more moderate ahead of the elections as Colin suggests. Yes Guy, maybe that was Putin's motive for making the statement? It seems to me that this is currently not likely, but as Putin said, maybe one day. The speculation is justified given Russia and China's current aggreements and dismissal of the Dollar, and Russia's outright statements regarding the U.S. and its addiction to debt based wealth. With the problems the Euro has however, it would seem hypocritical for Russia to make any moves in the near future until it has gained more solid footing. Yes Paul, if Russia ever joines the Eurozone it will be way into the future. Is democracy proving to be an unstable form of government? It appears that governments, reacting to the whims of the electorate, have been destabilizing their economies with excessive borrowing. Vociferous protesters are using street violence to insist on getting 'their share' of government largesse, even in the face of economic collapse. It seems that only 'strong leadership' can solve this problem. Are we on the brink of a worldwide dictatorship? Presumably you would like a strong tsar to rule the world? The timing is interesting ahead of the elections next year. Hard to know if this is a serious gesture or a political one. Seems out of character for Putin. Yes Colin, it's interesting to ponder upon what made Putin make the statement, isn't it. Maybe it's as simple as the election next year as you say? Is it too naive to think about a third common currency between Russia, China and other emerging Asian economies?